I've found that the second time around as a parent, I've been way lazier about initiating creative projects. And sometimes I feel pretty bad about it because Violet clearly loves creative projects, especially sensory-related ones. So I'm thrilled about Asia Citro's 150+ Screen-Free Activities for Kids. Replete with doable projects, simple instructions, and great photos, this book is inspiring me to try a new activity with Vi each week. Our first project? 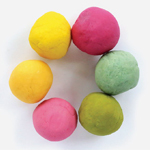 The classic play dough, which is the first homemade dough recipe I have tried that is easy and actually works! If you want your kids to enjoy more doing and less watching, get this book. Shop The Grommet's Pop-In Shop!